Ayurveda is a simple, practical science of life whose principles are universally applicable to each individual’s daily existence. Ayurveda speaks to every element and facet of human life, offering guidance that has been tested and refined over many countries to all those who seek greater harmony, peace and longevity. The knowledge supplied in this book will be of lasting value to the reader. This book is mainly concerned with presenting a basic over-view of Ayurveda, including techniques of examination, diagnosis and treatment; promotion of longevity; he use herbal remedies and other practical everyday aspects of maintaining health. More than 50 concise charts, diagrams and tables are included, as well as a glossary and index in order to further clarify the text. Dr. Vasant Lad, a native of India, has been a practitioner and Professor of Ayurvedic Medicine for more than 15 years. Dr. Lad has lectured extensively throughout the U.S. and has written numerous published articles on Ayurveda. "Dr Lad offers a good introduction to ayurveda. There is a surprising amount of information in a relatively small book, and the style is clear and accessible. The book introduces ayurvedic diagnostic techniques, types of treatment, diet, medicinal uses of common herbs and spices, and antidotes to certain types of food. Vasant Lad is a pratitioner of ayurveda, and a well-known and respected author and teacher." I was living in the mountains for a year nestled snugly above the famous Cape Point of Cape Town, South Africa. One of my housemates returned from a visit to India and brought with her some books on Ayurveda, this amazing healing art she reported had helped cure her of some ailments whilst she was abroad. I had been studying natural medicine for many years and the word Ayurveda which means --- Science of Life, seemed to echo something sweet and timeless in this direction. I opened the pages of this book only to discover, or should we say, re-discover, the authentic Ayurvedic science. A miraculous mystical science which understands the body and its harmony and disharmony in a very profound way. Little did I know that the pages of this book would lead me around the world on a journey to discover Ayurveda - The Science of Life. 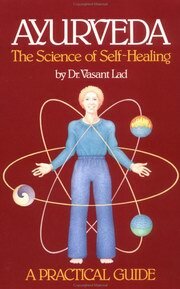 In 2003 I sat briefly with the author of this book, Dr. Vasant Lad, and enjoyed some of his classes and teachings. He is a great doctor, humanitarian and teacher of this great, profound, ancient science. This book is a perfect introduction to Ayurveda for all! I was living in the mountains for a year nestled snugly abov ..